Here are a couple of videos showing how to factor and divide positive trinomial expressions. The first video shows how to factor bigger expressions. Note that the idea or concept is to get used to using the constant and the coefficient of x2 to figure out how to factor the problem. Most lessons from video tutors and how to vdeos on TeacherTube and YouTube tell the students to guess at it or just try all the factor combinations. If they get familiar with these problems they can begin to work out their own algorithms and rules for how to factor the bigger ones, because there is a method to it beyond just trying sets of factors. And here we see how multiplication and addends are SO important and need to be mastered in order make algebra easy. Which is why you see me stress the 45 addends and multiplication over and over again with the younger students. For the older students who are often having a hard time, going back to the basics of multiplication and addends makes huge improvements in algebra FAST. 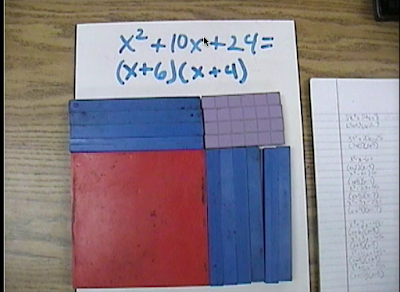 The second video shows how to take factoring problems and turn them into division problems. Soon you will be able to get an eCourse that shows you step by step how to do it. Right now if you want to see how to do negative expressions using the blocks you'll need a password to get into this page. Once you get familiar with these you'll see that the following set of problems are related and are actually pairs of problems. 2x2 + 8x + 6 I forgot to mention it in the video screencast but you might want to take a moment and turn this into a division problem too...you know the factors. See if you can. 2x2 + 3x - 27 BTW they told me this I didn't tell them how to make it "factorable." 2x2 + x - 10 can. in fact you see it in all positive form in the first video. If you want to see it done with the blocks and a even a drawing you will need a password as I mentioned earlier. If you go there right now you will find an hour's worth of videos you can't get anywhere else. I'll be adding even more video and things like pdfs and links to further explanations but there should be plenty there to keep you occupied there NOW. The hour's worth of video is worth a buck. Check out the Parents/Teachers Tab it now has MUCH more stuff including links to websites that offer lots of USEFUL FREE stuff, like lesson plans, grant information, discounted school supplies and more. I also took the trouble to get you discount codes for 10% to 20% more off...cuz I'm cool like that. 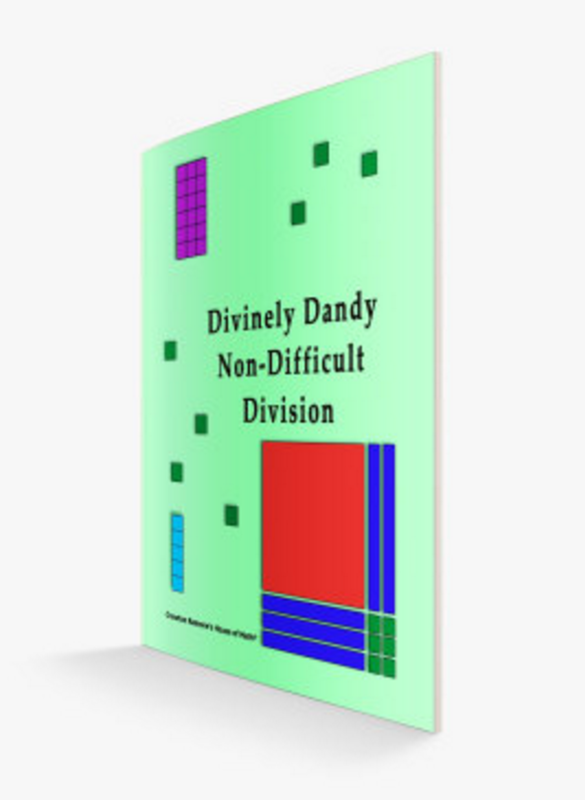 Get Divinely Dandy Non Difficult Division for just $19.99. This book will show you everything you learned here and MORE laid out step by step with links to videos and pages that give simple concise explanations for how to use the rectangle to organize thought, how to introduce division concepts at a very young age, and how to make fun while you are doing it. I guarantee that video alone will expand your thinking when it comes to division and math. Watch the video on the Preview and Purchase page that gives you a page by page over view of the PDF so you can "try before you buy", see exactly what you are getting and be confident it will be money well spent.